Iranian President Hassan Rouhani urged all people including the political parties to be united to disappoint enemies who sow discord among the Iranian nation. ’’Come together to help each other and disappoint enemies,’’ President Rouhani said to a gathering of people who attended rallies to mark the 39th anniversary of Iran’s Islamic Revolution in the capital, Tehran. ‘’Give people hope,’’ the President said, addressing the opposition political parties. The president also underlined resisting foreign or possible domestic pressures in a bid to reform the structure of country’s economy. He said the government is committed to fight air pollution in big cities, dust pollution in some border provinces and also draught in cooperation with the regional countries. 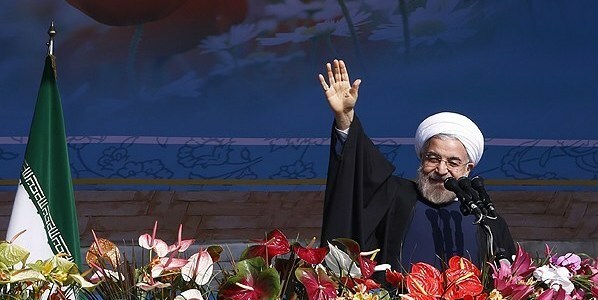 Rouhani joined the millions of people in Azadi Street who, along with people in other parts of Iran, were marking the anniversary of the victory of the Islamic Revolution. The day of Imam Khomeini’s return to Iran from exile (Feb 1, 1979) marks the beginning of the Ten-Day Dawn in ceremonies which culminate with the anniversary of the victory of the Islamic Revolution on February 11, 1979. President Rouhani referred to the progress made in the country in various fields saying that, for the first time, Iran is recovering more oil from the joint oil fields with Qatar, south of Iran. Elaborating on the government achievements, he said that Iran’s gas production from the joint gas fields with Qatar in South Pars has increased from 285 mcm to 553 mcm. Iran’s oil production from the joint oil fields with Iraq was 70, 000 bpd in 2013 that has increased to 305 bpd, the president added. He also said that the government absorbed 32 billion dollars of direct foreign investment in the current year (started March 21, 2017).